From there, choose the "Debian 7 32 bit Minimal" template, as shown here. 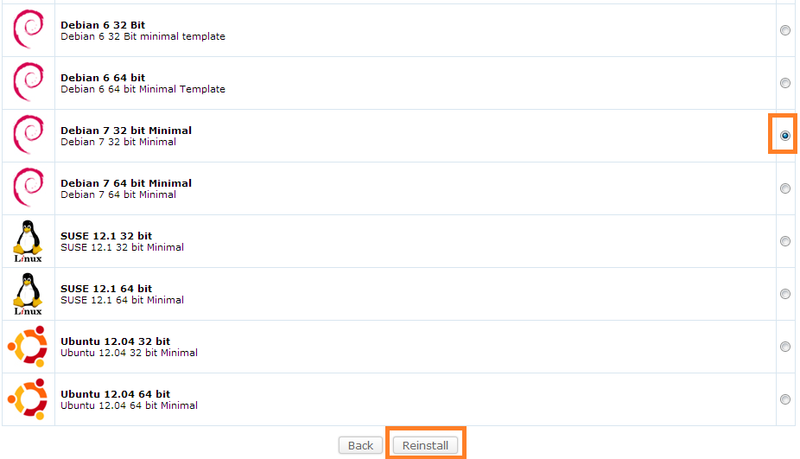 And then press that neato little reinstall button. From there, using the words of Mihko (Source Post). 1) Connect via the serial console and set your ssh port to one that is assigned to you. (via editing /etc/ssh/sshd_config) and changing the Port 22 entry to a port that is assigned to you. 2) Using this thread, obtain your IPv4 Address. So we've gone this far. Let's start on ZNC. Now, you can't run ZNC as a root user. It just isn't possible because security is actually a factor in ZNC. So you'll need to create a new user called ZNC. Unfortunately, ZNC doesn't come with a set of default configuration files, so you'll need to generate that now. The general rule of thumb, don't enable things you don't need since they have the potential to waste your resources. But I recommend enabling webadmin, which is the second entry. Everything after that will include nicknames, real names, buffer (I recommend 200, assuming you aren't joining every channel on Freenode) e.g. It's generally far more easier to conduct everything in the webadmin, which should now be running in the same port as your ZNC bouncer. 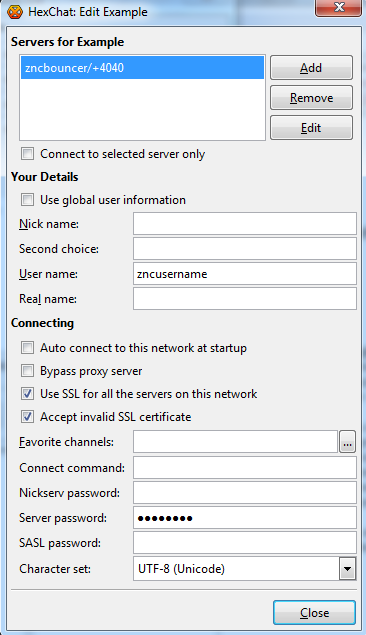 In this prompt, check "Use SSL for all server on this network" and "Accept Invalid SSL Certificate." As well, if you wish, uncheck "Use Global User Information," replacing the username box with the username you have created within ZNC setup. Also, in the bottom portion of the prompt, put in your "Server Password," which will be the password that you use with your ZNC account that you have created. Please feel free to order a LES VPS and do not pay the invoice, I will take care of the rest. Quick response, I was just banned a moment ago. I'll improve on the tutorial tomorrow, seeing as I'm sure I left a small detail out. I assume most LES users can figure it out, since it's very straightforward. You're a really cool guy Anthony. Would you like to write these kind of tutorials for lowendguide.com ? If I may ask, is there a possibility of multiple positions? I would also be interested to write for a bit of money. By the way, I totally suggest building ZNC from source. The version in the repository is kinda old (at least, the one in Debian 6), and doesn't support clearbufferonmsg (Pretty much it makes ZNC usable from more than a single device for me. It clean the message buffer when you write a message, so you can leave a client connected all the time, connect a second client and still get all the messages you didn't read). With this, ZNC should end up installed in /usr/local/bin. Really nice tutorial for dummies, dude. Given the recent problems with IRC and ddos, maybe update this sticky with some information about potential problems. I believe on some nodes IRC is banned completely. It would be nice to document that.